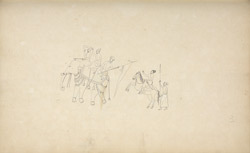 Pen-and-ink drawing dated January 1801, of equestrian figures from the wall paintings of the ceiling of the Uchappaya Matha at Anegondi in Karnataka, taken from an album of 56 sheets of drawings (60 folios) mainly of miscellaneous architecture and sculpture in the Deccan and S. India. ff.31-38 depict ceiling paintings at Anegundi, dated 1793-1806. Some drawings are by MacKenzie himself, others by his draftsmen, including C. Ignatio. Anegondi, now a small village situated on the northern bank of the Tungabhadra river, was the first capital (c.1336-1368) of the Vijayanagara rulers who reigned on the most powerful Hindu empire of South India between the 14th and the 16th centuries. The whole area is imbued with mythological significance. The ancient Kishkindha mentioned in the epic of the Ramayana, ruled by the monkey chiefs Vali and Sugriva, is believed to have been situated at Anegondi. When the Sangama rulers established Vijayanagara as their new capital on the south bank of the Tungabhadra, Anegondi continued to flourish during the Empire Phase (1368-1565 A.D.). After the catastrophic defeat of the Battle of Talikota in 1565, the victorious Muslim army used Anegondi as a base for pillaging the Vijayangara city. Numerous ancient shrines, gateways, walls and the fortifications on the surrounding hills suggest that in the past Anegondi must have been a fortified settlement of considerable importance. The architectural remains at this site date back to the 12th and 13th centuries to the present day. The Uchappaya Matha, a dilapidated two-storeyed structure to the south of the village, is of interest for the fragments of Vijayanagara paintings preserved on the ceiling beams. The major part of the paintings, though, no longer exist. This drawing depicts some of the figures from these paintings. In 'A survey of Painting in the Deccan' of 1937, Stella Kramrisch wrote, "The paintings on the ceiling of the Uchayappa Matha at Anegundi to-day present a black and white effect with some red lines of the preliminary drawing left. The colours have disappeared but for an eight petalled lotus with a yellow centre, surrounded by red, on a blue ground in a niche of the wall. Traces of the same colours are preserved in the spandrils and between the pilasters of the wall. Such a fresh blast of colour must be surmised also in the paintings of the ceiling, constructed of large stone slabs. These are covered with a thin white plaster. The entire ceiling, it seems, of the pillared Matha had been painted...In the Anegundi paintings, which can not be prior to the third quarter of the sixteenth century, the figures to a considerable extent adhere in body and movement to classical coinage. They have powerful limbs and vehement gestures...The faces however are almost always in profile or front view. Their firm outline conveys mediaeval rigour...".